New Zealand-born Flutey qualified for England on the grounds of residency in 2007 and England manager Martin Johnson wasted no time in calling the London Wasps' playmaker into his first squad in the summer of 2008. He made his debut alongside Wasps' team mate Danny Cipriani, helping to steer England to a 39-13 win over the Pacific Islanders at Twickenham and then started against Australia, South Africa and New Zealand. 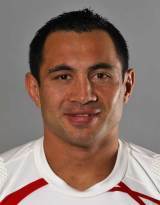 He began his career as a scrum-half, where he played most of his New Zealand age grade rugby, including winning the 1999 IRB U19 World Championship before switching to No.10 for New Zealand's U21s. However, he travelled to England in 2005 having played for Wellington Hurricanes in the Super 14 as well as New Zealand Maori. In his two seasons with London Irish he scored an impressive 272 points, including 15 tries before joining London Wasps in 2007, where he helped them become Guinness Premiership champions earning him the respect of his fellow players, who voted him PRA Players' Player of the Year for 2008. A stand-out contribution to England's Six Nations campaign in 2009 saw him rewarded with a place in the British & Irish Lions squad to tour South Africa. His selection in the first tour match against the Royal XV saw him join an exclusive club of those players to have played for and against the Lions having lined-up against the elite tourists for Wellington in 2005. He joined the only other known player to have completed the feat - Irish forward Tom Reid who toured with the Lions in 1955 before lining up against them in 1959 as part of Eastern Canada. With South Africa holding an unassailable 2-0 lead in the 2009 series, Flutey played the third Test and helped set up wing Shane Williams' second try as the Lions won 28-9 in emphatic style in Johannesburg. A high-profile switch to French club Brive followed later the same year but a shoulder injury suffered whilst on duty for the Lions limited his early season contribution. He was forced to undergo surgery that sidelined him for three months but he returned to fitness in time for the Six Nations but a thigh injury ruled him out of the Championship opener against Wales. He made a swift recovery and started all of England's remaining fixtures but struggled to find his best form. Flutey returned to domestic duty with Brive following the Championship but aggravated the same shoulder that had required surgery the year before. He swiftly agreed a return to England with former club Wasps prior to the 2010-11 season. Flutey continued to be troubled by injuries and he sat out England's entire autumnal campaign. However, upon his return to full fitness he was recalled to the squad for the 2011 Six Nations. Flutey failed to make an appearance though but made Martin Johnson's 45-man training squad in June 2011. He made his return to England colours against Wales in the first World Cup warm-up game in August but failed to earn a place in the 30-man squad for the tournament itself in New Zealand.